AQ: FamilySearch Family Tree Certifications~What Does it All Mean? When FamilySearch Family Tree replaced nFS, features that were certified for nFS were no longer valid. A new set of certification requirements came into being and the re-certification process began with all FamilySearch partner products. Each symbol above stands for a specific certification connected with interacting with the new FamilySearch Family Tree. Ancestral Quest is fully certified in each certification! Let's review each certification in order to get a better understanding of how AQ measures up to these new requirements. 'TreeShare': the ability to fully read and write Family Tree data to match, compare, and modify records. This also includes required certification for sources, discussions, change history, and interaction with comunity members. 'Sources': requires Tree Access or Tree Share certification. One can read Family Tree data allowing a user to match and reference online 'sources' that provide evidence of events and relationships. Sources can be records, photos, documents and media. 'Discussions':requires Tree Access or Tree Share certifcation. One can read, write and comment on discussion treads for individual records in Family Tree. 'Change History': requires Tree Access or Tree Share certification. One can read and list changes made by contributors to the Family Tree, sources, and discussions. 'LDS Support': requires Tree Access or Tree Share certification. Specific data and features for 'LDS Members only' can only be accessed when the user is correctly logged into FamilySearch. Tree Access certification is necessary for reading ordinance information. Tree Share certification is necessary for requesting, changing, sharing, and printing the Family Ordinance Requests (FORs). Extra! Additional Features with Family Tree! 'Notes' Allows users to view notes of individual records in Family Tree and exchange notes between Family Tree and the notes in their personal file. AQ is the only FamilySearch Tree Share certified program to have this feature! 'nFS' Allows users to read other opinions of vital facts stored in new.FamilySearch (nFS). As not all information was migrated over to Family Tree this valuable information could easily be overlooked. AQ is the only FamilySearch Tree Share certified product to offer this read-only access to nFS data. 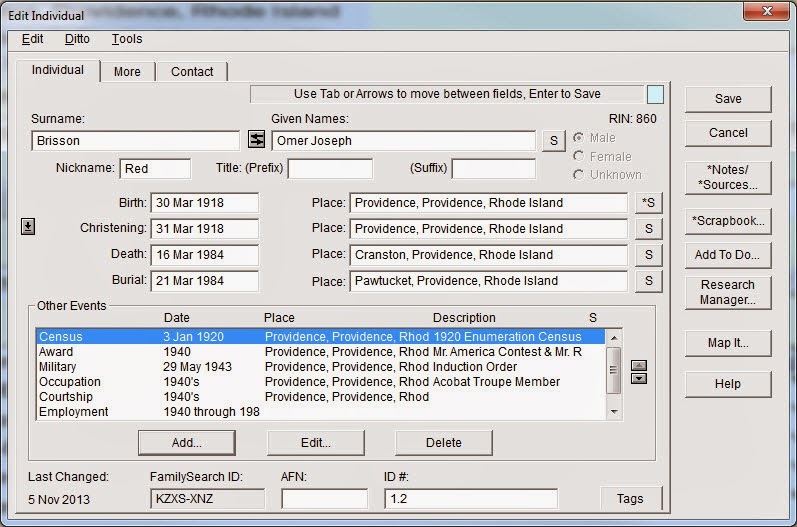 This additional interaction with FamilySearch Family Tree combined with a long list of powerful features makes Ancestral Quest the logical choice for all your genealogical and family history database needs. Awesome new features for Ancestral Quest! When it comes to remembering the cost of freedom, most Americans can relate and have been touched by knowing someone who has been either in the past or currently is in the military. Whether they are a relative or a friend there is someone. Towards the end of High School I had a class mate who lost her brother to the Vietnam War, I have uncles, cousins and brother who have fought and all I and others can do is to say "Thank You". As there are no words that really express the depth of gratitude that we all share in appreciation for what those individuals have done for all of us. Thomas MacKntree started the above Pinterest board for individuals to post pictures of loved ones gone but not forgotten. I suspect that this great Pinterest Military Board will continue to grow and grow throughout time to become another outstanding remembrance to those who protect our freedoms as well as love and appreciate. Taking this a step further, AQ allows you to post a link in your database for individuals who have links to other places online which can prove to be very helpful. 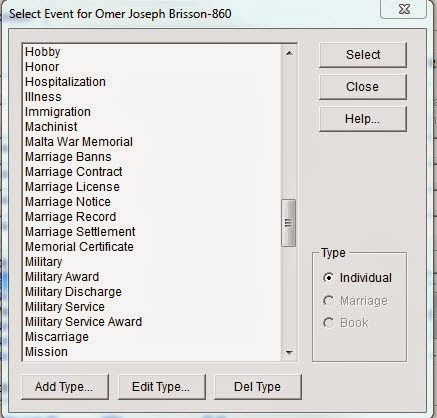 For instance if you have a blog article on a military ancestor or even an online document, you can place that link in that persons individual record so you'll always have access to it. Note that under 'Location' is the URL and if I click on 'Show' at the top it takes me right to that blog article, a very nice feature. However, with AQ being resident on our own PC, what would happen if you have no Internet to that page online? The easiest way to handle that is to open up the website and find where the "Print" is located, it is usually in a different place for each browser. Once you click on the "print" change the print location to a PDF file and it will capture the whole thing regardless of how many pages it may be. I would then attach the 'Document' PDF by showing its location on my own computer. This would provide me access whether online or not and is a simple way to save an online page. I am extremely grateful for all who have served and are serving to protect our freedoms each and every day. Another great resource in Ancestral Quest! Life is amazing in that there are many things that happen to us besides being born, getting married and moving on to the next life, however, often in genealogical softwhere it is now always evident of where to put those "other" important events in ones life. So what constitutes an 'Other' event? Well that can actually depend upon each person. 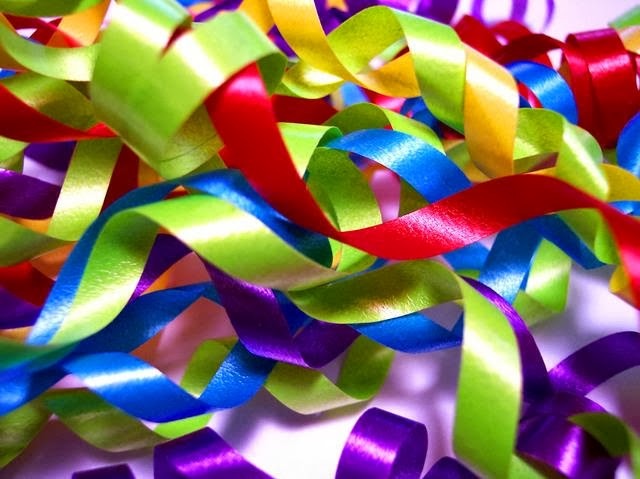 While there is a default list that comes with the program and covers 120 different events, one can easily add an 'Other' event that could be unique to their family, an organization or even a school system. Notice this bottom section which shows many of the 'other events' I've added for this individual. It is worth pointing out that whenever you add another event, the program will automatically put then in date order for you. This is important as sometimes one finds out additional important occasions in an acestors life long after you've enter the main information into the database. Notice that there is a "Select" button at the top where you can choose from the 150 current events already listed, however, if what you are looking for is NOT there, you can just click the 'Add Type' and add it to the list, then click on the 'Select' button and proceed to enter the additional information. To make sure these 'Other Events' are included in your reports, make sure you click that box on the 'Reports and Charts' Screen before you print it and they will be there! This is a powerful tool as you work at buiding the complete picture of your ancestors life. 2) Selecting the Source and Attaching it to an Event which is only available in AQ. Regardless of the reason, Ancestral Quest allows users to enter 'individual notes' and 'marriage notes'. The program is very much aware that everyone does things just a bit differently and tries to accomodate accordingly. So just what is the main difference between taking the time to enter the information through sources part of the program or just simply entering the information in notes? The difference is in the printed end results. Note the corresponding numbers next to the date in 'Born' matches the same number in the Notes section of this printed Family Group Sheet and this would be the same if it were a Pedigree Chart or a Report. If you use notes, there would be no footnotes next to the date in 'Born' but one would see what was entered in the 'Notes section' at the end of the record. When printing a Pedigree chart, you would have to put a check mark in the box 'General Notes' as you would for 'Sources' or they will not print out. For a Family Group Record those options are defaulted for you. 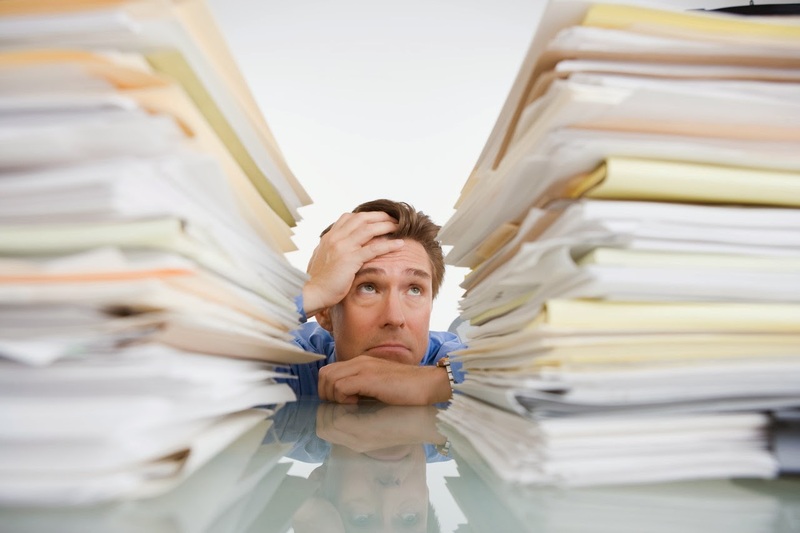 It is hoped this discussion on documentation has been helpful! Yesterday we stepped through the process of taking an event, in this case it was a marriage, and attached the source, a marriage registration certificate. 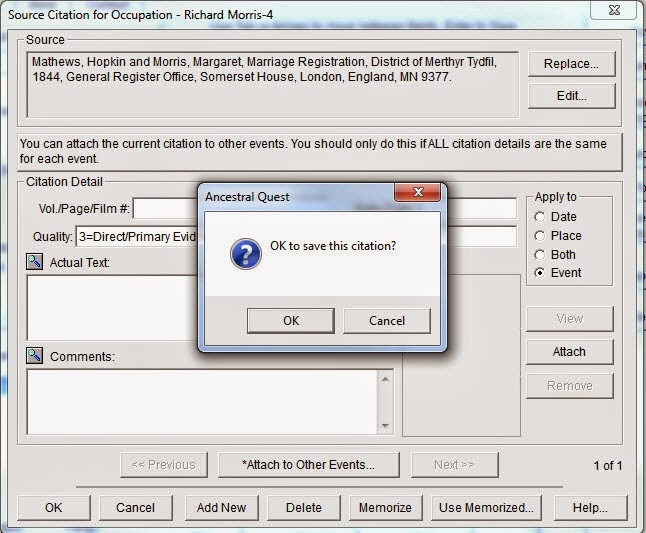 Today we will review the steps to select this same document and attach it to other events cited in this souce, which is a little different and perhaps not as well known feature in AQ. 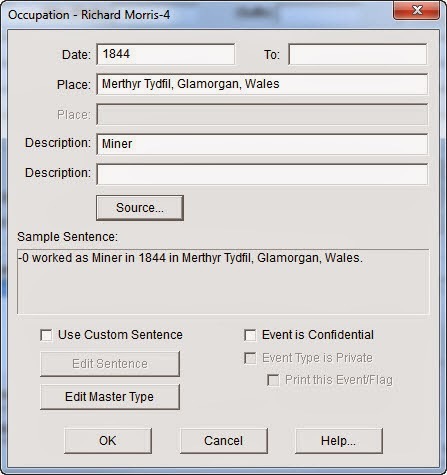 -Marriage date and place as "17 June 1844 in Merthyr Tydfil, Glamorgan, Wales"
Using this "Citation Links" screen, you can very quickly attach the source citation to as many events as you have recorded. Use the Search button to locate an individual or a marriage. You will be shown a list of all events for that record. Now select an event this documented by this source citation and choose "Apply to" which causes this same citation to be attached to all these events from this one screen. Once done, click on "Close" and "OK' on next two screens and then 'Save' to get back to your database. The results of both methods will result in footnotes that show up on your Pedigree Chart, Family Group Records and all reports! 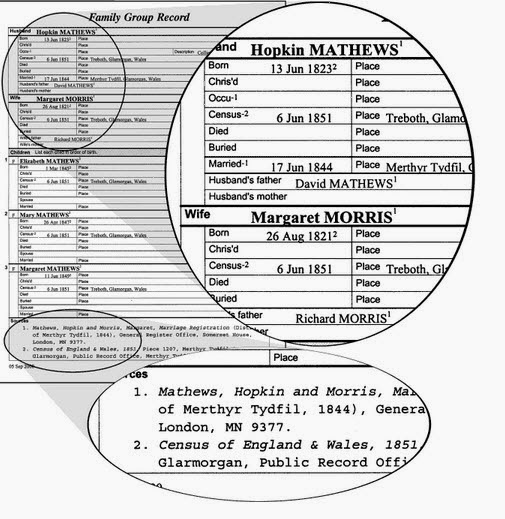 Both Family Historians and Genealogists connect generations together with documentation and usually it is a lot of documents for just one individual or a whole family. 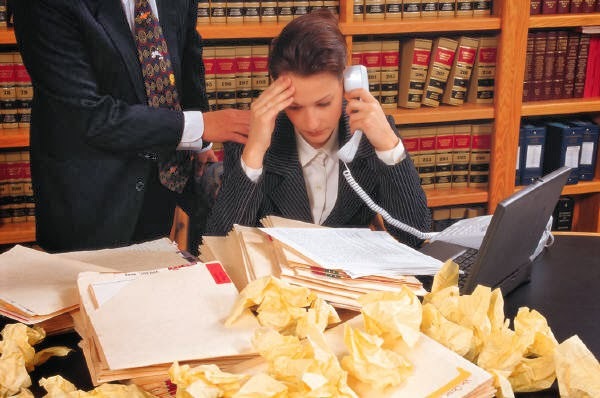 How this is handled can be like the nightmare in our picture, however, in AQ it is not that complicated and should never be put off for 'later', talking from experience, often 'later' doesn't come and the origins of that record source can be lost forever. As I was not sure if there was a source listed already, I clicked the 'Create' button which brought up the next screen. 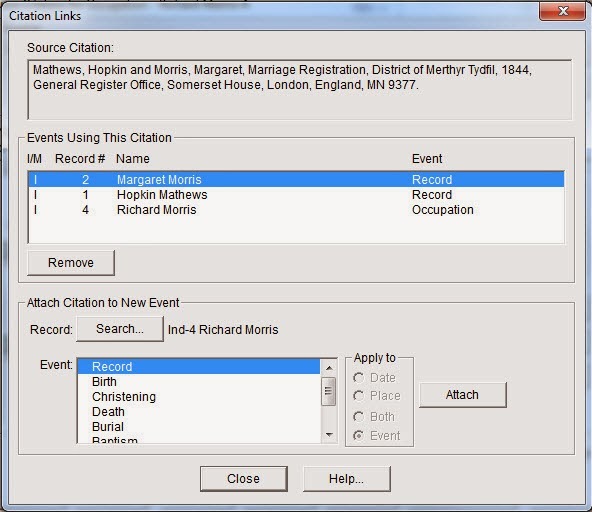 Click OK when done, the source has now been created and the Source Citation Screen now is displayed. For this type of record there is need to fill in any additional citation details so I am done. You could add a location of this record in your home with a reference number if you wish but otherwise just click 'OK'. Next I need to add Hopkins' wife into my database. Following the above method, I click on the 'S' button next to Margaret's name and again I would be looking at the same screen as above, however, instead of choosing 'Create' I click on 'Select' as this source already exists. 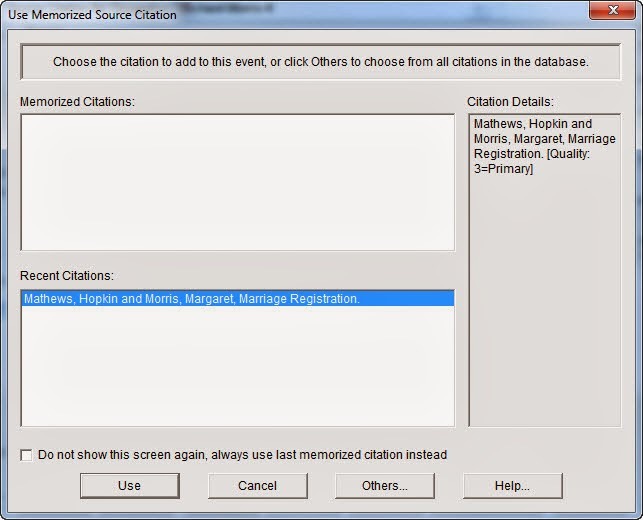 Select the same source from the list of sources and click 'OK' which opens up the 'Select Citation' screen again. Making sure the correct one is highlighted and click on 'Select from List'. This does not create a new citation, it will attach this new record to the same citation. This will cause the same footnote to appear for both Hopkin and Margaret. 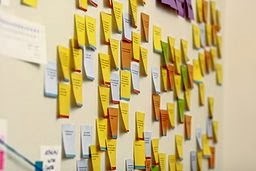 Following this method will add your documentation greatly. Tomorrow we will review how to Select the source and attach it to the event , this is a method that is only available in Ancestral Quest!